The simple, whitewashed exterior of San Pedro Apóstol de Andahuaylillas gives no hint as to the mesmerizing murals within, which depict biblical scenes imbued with Inca symbols. Along with lavish embellishments such as a gold-leaf altarpiece, these have earned the church the moniker Sistine Chapel of the Americas. The comparison of St. Peter the Apostle of Andahuaylillas (San Pedro Apóstol de Andahuaylillas) to one of the world’s top attractions garners it lots of attention and places it firmly on the itinerary of many Cusco tours. Travelers can visit the landmark as part of a day trip from Cusco, many of which combine the church with visits to Tipón, an elaborate network of Inca agricultural terraces, and Pikillacta, home to pre-Inca ruins. Both archaeological sites attract a fraction of the crowds of Machu Picchu. San Pedro Apóstol de Andahuaylillas is a place of worship, so dress appropriately and speak quietly inside. The marriage of indigenous culture and Spanish designs is a must-see for culture vultures. In the village of Andahuaylillas, you’ll find plenty of restaurants and cafés where you can rest and refresh. The village of Andahuaylillas is approximately 1–1.5 hours by car from central Cusco, depending on which route you take. Travelers who want to avoid the hassle of car rental or public transport generally opt for the convenience of a day trip, which includes round-trip transport and gives you time to focus on the stunning scenery of the Peruvian Andes. San Pedro Apóstol de Andahuaylillas is open daily from morning until night; however, due to extensive restoration, the church occasionally closes. Check the website for the most up-to-date information. When Spanish missionaries were cementing their hold in this Inca region, they often used murals as a way to overcome the language barrier to evangelize the local population. Unless you know the stories and history behind the paintings, the murals can be visually overwhelming. Opt for a guided tour to enhance your experience of the church. See Peru's most spectacular natural and archaeological wonders on an exciting 10-day tour. Explore the country's cosmopolitan capital, Lima, before setting out for the Amazon Jungle, where you'll bed down in thatched-roof bungalows and enjoy days embarking on jungle treks and seeking out native howler monkeys and sloths. Next up is Cusco―once capital of the Inca Empire and entryway to both the Sacred Valley and Machu Picchu, each of which you'll have ample time to experience. Then its off to Lake Titicaca and a visit to its manmade Uro islands. Break up the long journey between Cusco and Puno on this full-day transfer via Andahuaylillas and Raqch'i. Departing Cusco, you’ll stop at San Pedro de Andahuaylillas (Sistine Chapel of the Americas), set in the central square of a tiny Andean village, and Racch’i, an ancient Inca archeological site. Plus, you’ll enjoy a buffet lunch and stop at the Pucara Museum before arriving in Puno. Hotel pickup is included. Experience two of Peru’s most iconic sights, Machu Picchu and Lake Titicaca, plus much more during this 8-day, 7-night trip through the country's biggest highlights. Explore the wealth of Inca history around Cusco, including the iconic UNESCO World Heritage site of Machu Picchu and the many ancient Inca ruins throughout the Sacred Valley. Then continue on to Lake Titicaca by first-class bus, exploring the unique Uros Floating Islands built from totora reeds and the beautiful scenery of Taquile Island. Your Peru adventure covers a guide, 7 nights of accommodations, meals as per the itinerary, bus and train transfers and all site entrance fees. Experience all that Peru has to offer during this 15-day, 14-night trip covering visits to the Amazon, Machu Picchu, Lake Titicaca, the Nazca Lines, Colca Canyon and much more. Spot exotic wildlife in the Amazon and then discover the history of the Incas during time in Cusco and the Sacred Valley. You’ll also spend an unforgettable day exploring the UNESCO World Heritage-listed Machu Picchu before heading to Lake Titicaca to discover the lake’s unique floating islands. Then search for Andean Condors above the Colca Canyon. Finish your trip with a flight above the mysterious Nazca Lines. This Peru highlights trip also covers a guide, 14 nights of accommodations, meals as per the itinerary, bus, boat and train transfers and all entrance fees. Tour Peru highlights without planning a thing when you book this 8-day tour from Lima. From city sightseeing in Lima and Cusco to stunning archaeological finds such as Machu Picchu and Ollantaytambo, this tour takes you to the places you most want to see. All accommodation, transportation, and activities as per itinerary are included. Most visitors to Cusco head straight to Machu Picchu, but the surrounding valleys also harbor some of Peru’s most fascinating historic sites. 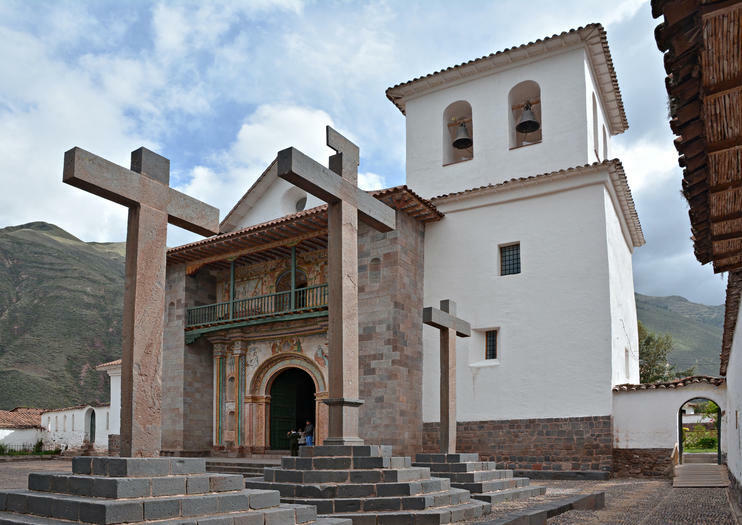 This full-day small-group tour takes you off the beaten track, visiting the Inca site of Tipon, the pre-Inca site of Pikillacta, and the Baroque church of Andahuaylillas. Hotel pickup and drop-off is included. Travel from Cusco to Puno, gateway to Lake Titicaca, during this 9-hour scenic sightseeing trip. During your ride you’ll have a chance to stretch your legs and explore a variety of cultural and natural landmarks. In the morning, admire the mural paintings of the Andahuaylillas Church and visit the remains of an Inca temple in the town of Racchi. After an included lunch you’ll check out the ceramic-making industry of Pukara before arriving in Puno in the afternoon. This trip from Cuscu to Puno also includes a guide, private transfers to and from your hotel in each city, entrance fees and a buffet lunch. Though less popular than the Sacred Valley, the South Valley of the Incas rewards its visitors with an equally impressive historical roster and fewer crowds. And thanks to its proximity to Cusco, it makes for an easier day trip than the far-off Sacred Valley. Explore the South Valley of the Incas with a guide and a small group on this tour from Cusco, which includes hotel pickup and drop-off from your Cusco lodging as well as all entrance fees, transportation, and guided commentary. Make the most of the scenic trip from Puno to Cusco on a full-day tour, and explore the Temple of Kalasasaya, an Inca sanctuary, a vicuña ranch, and Andahuaylillas as you cross the High Plateau. Instead of rushing past sites as you would on a basic bus trip from Puno to Cusco, you’ll turn the long drive into a fascinating day of sightseeing that includes lunch at a country restaurant. The greater Cusco region is known for its vast historical and archeological sites. Set out on a half-day tour to explore them. You'll visit Tipon, home to an ancient Inca agricultural system, and tour the ruins of Piquillacta, once inhabited by the Wari people. Your trip also includes a visit to the church of San Pedro de Andahuaylillas, filled with colorful murals. Explore the Vilcanto River Valley south of Cusco on a half-day sightseeing excursion—a tour with special appeal for first-time visitors with limited time. With pickup from your hotel, enjoy easy transportation in a comfortable coach and visit outlying towns that are difficult to reach on your own. Tour the Inca archaeological sites of Tipon and Quiquillacta, visit traditional villages, and sample South Valley cuisine. Cruise down the great open road on a motorcycle tour of the South Valley. This tour leaves from Cusco and stops at a number of sights such as Tipon, Huacarpay Lagoon, Pikillaqta, and Andahuaylillas, dubbed as ‘The Sistine Chapel of the Americas.’ Spend the day away from the busy city and out exploring some lesser-known Inca gems. Si usted quiere conocer sobre el Perú antiguo evitando las rutas turísticas congestionadas, el Valle Sur en Cusco es perfecto para eso. Este es otro paquete turístico, muy visitado se asemeja a el Valle Sagrado, estamos seguros que lo disfrutara. Welcome to Cusco - Peru. On this tour you will enjoy breathtaking scenery, ancient culture and authentic experiences with locals.This experience will be giving you the unique and magnificent tours to the sites of Tipon where you can enjoy the impressive irrigation system of the Incas, then to Piquillacta where you discover the huge urban planning of the Wari culture (pre-inca). After the visit to Piquillacta, you move on to Andahuaylillas where “the Sistine Chapel of the Americas” is located with its impressive mural paintings from the XVII century.You’ll get up close to ancient cultures and awe-inspiring natural wonders in the company of local guides whose passion for their history is contagious. Machu Picchu Best Tours puts at your disposal the most fantastic and impressive tours to Machu Picchu. Visit Machu Picchu from the city of Cusco doing the most traditional tours like the City Tour in Cusco, The Sacred Valley, The Maras Moray tour, the visit to the South Valley, and a full tour in Machu Picchu. For the people who loves hiking, visit to the the Rainbow Mountain.• Day 1: Transfer from the Airport to your hotel in Cusco. In the afternoon: City tour. • Day 2: South Valley (Tipon, Piquillaqta and the temple of Andahuaylillas). • Day 3: Archaeological Center of Moray and the salt mines of Maras. • Day 4: Sacred Valley of the Incas (Pisaq Archaeological Center, Pisaq Handicraft Market, Ollantaytambo archaeological center). • Day 5: Machu Picchu (Citadel of Machu Picchu). • Day 6: Rainbow Mountain. • Day 7: Transfer from your hotel in the city of Cusco to the airport. Discover the wealth of historic Inca and off-the-beaten-path landmarks during this 6-hour sightseeing and private biking tour of the South Valley near Cusco. Spend the morning exploring by vehicle, beginning with the Inca aqueducts and terraces in the city of Tipón and the stunning religious art found at the local church in Andahuaylillas. After an included lunch, begin your cycle trip, enjoying views of lush farm fields as you ride, eventually reaching the famous market in Pisac where you can do some bargain-hunting. This combination sightseeing and cycling trip includes a private guide and vehicle, all entrance fees, lunch, biking equipment, water and cycling support van. Visit the Top 5 attractions of Cusco in just one package! Machupicchu, Humantay Lagoon, Rainbow Mountain, Maras Salt Mines & Sacsayhuaman. Three of Peru’s alternative ancient wonders: Tipon, Pikillacta, and Andahuaylillas from Cusco. Designed for history buffs, this tour covers the elaborate agricultural terraces at the Inca ruins of Tipon; the pre-Inca site of Pikillacta, which dates back to AD 900; and San Pedro de Andahuaylillas (Sistine Chapel of the Americas), set in the central square of a tiny Andean village.